The Online Reputation Tool for Smart Companies! Many companies do not realise that reviews are the second-most trusted form of advertising behind good old word of mouth. In other words, this should be the key focus of every marketing strategy. Why aren’t more companies focussing on reviews then? The answer is that they simply do not know how. 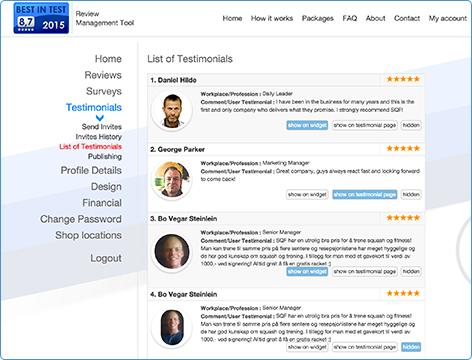 Best in Test software makes it possible to collate large numbers of reviews, keep control of them and build an excellent online reputation, which is worth its weight in gold. Claim your FREE version here! Analyse customer satisfaction of your company by actively asking customers to rate their satisfaction based on 5-8 questions. The problem with reviews is that customers receive many by email/SMS/telephone, which feels like spam. With BIT, the main focus is on obtaining reviews completed on location via the Best in Test iOS/Android app. This is a personal approach and the result is an extremely high response rate. These ratings will automatically be transformed into customer references, a stable online reputation and higher Google placement. 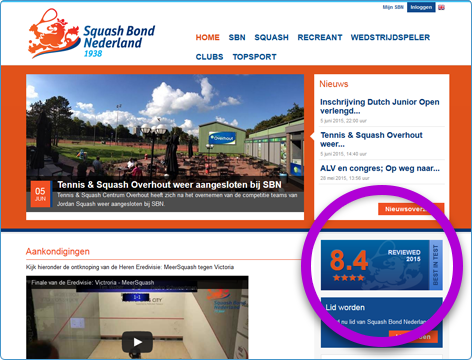 You can, of course, publish all your results on your website via our online interactive scoring banner (see example on www.sqf.no), in only a few clicks. Try our mobile app for free! 2. 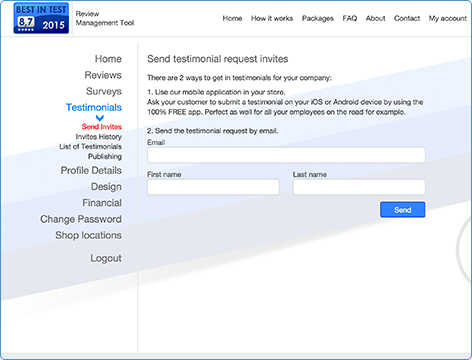 Download the app, log in and ask your customers to fill a review on your device. It is that simple. 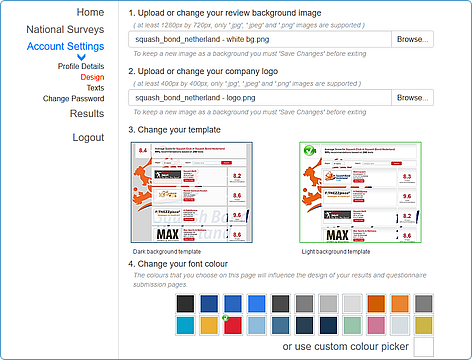 Show your customers that you care about their opinion, it only takes like max 30 secs to fill out. Moreover it gives you vital information and fantastic marketing opportunities! 3. 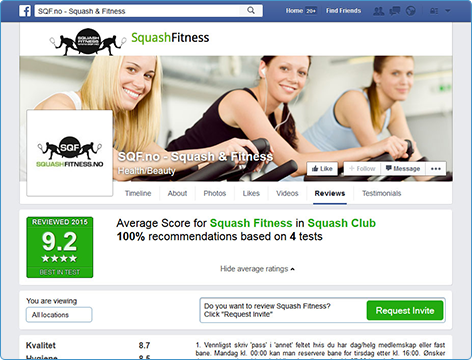 Add the Best in Test Facebook app to your business page and finally get control over your Facebook reviews as well! 4. Receive reviews via your Facebook page, by email or by asking face to face with our FREE iOS/Android app and gain control over your online reputation! 6. Respond to your customers’ reviews and engage with unsatisfied customers. Negative reviews will not be published immediately – you will have 14 days to contact the customer to find out why he/she is not happy and invite them to reconsider their review. 7. 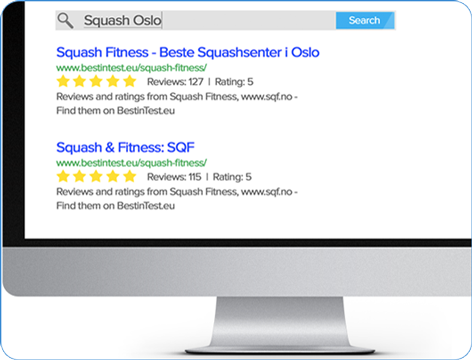 For companies with several locations: compare different sites, find out why certain locations are doing better than others and improve the weaker ones. 9. 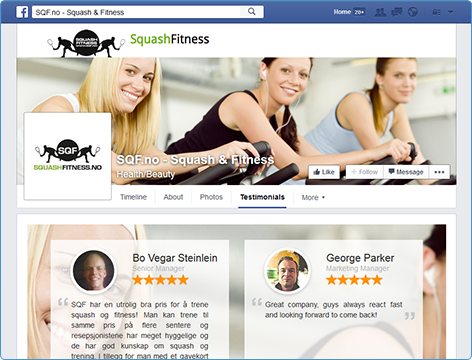 Share reviews on social media. 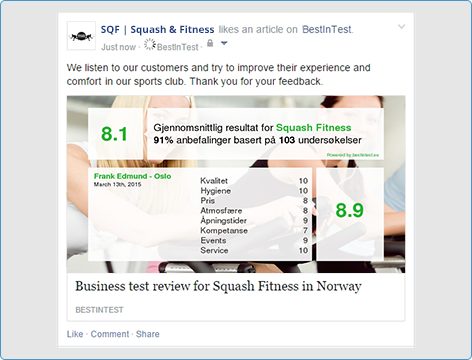 Your customers are politely asked to share their ratings (when positive) on Facebook. 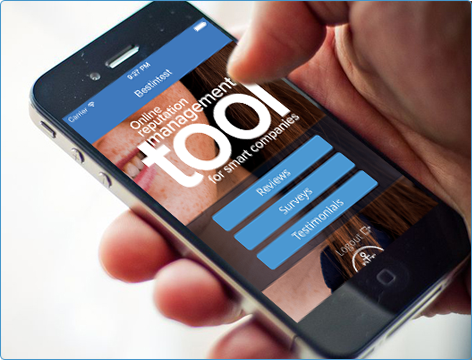 It is the perfect tool to generate positive word of mouth about your company! 10. After having used BIT, Google will index all your reviews and will show them with stars in the search results. The franchise/association’s head office will have access to a ProChain+ account where they have a complete overview of how each member organisation is performing through a continuous process of benchmarking/monitoring. 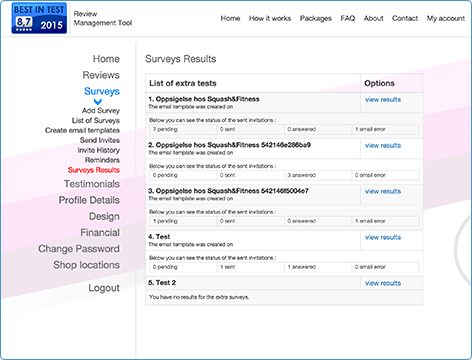 Each member of the franchise/association will have its own review software package (Pro Account, see "How it works" for more info). 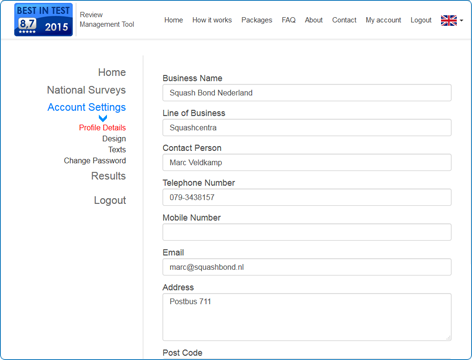 All franchise/association members will be connected to your ProChain+ account and show in an overview page. 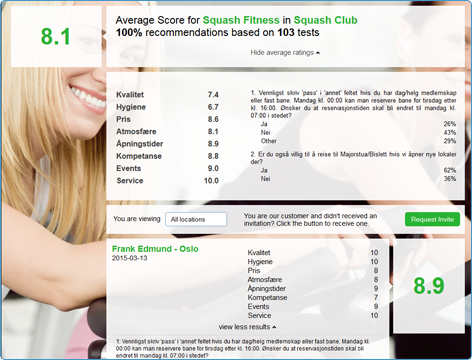 By clicking on each member, you will see the detailed review results of that member. 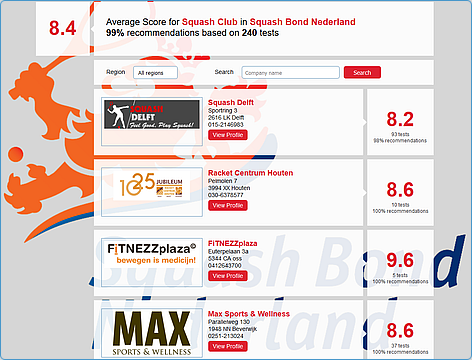 With this tool, the head office can easily see how active their members are, which are performing best and which need additional support with many more features designed to improve quality of service with the aim of creating a perfect online reputation with higher Google search results. 6. Show the average score of your members via the interactive scoring banner on your association’s website. The banner can be customised to your house style. 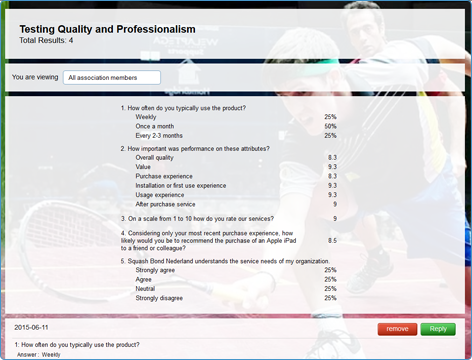 With the testimonial tool, you can collate many testimonials and decide which ones will be published on your website. 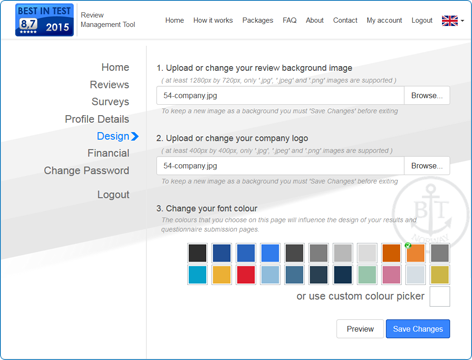 If your customers have already given you positive feedback, our tool allows you to ask them for a written testimonial, which you can then decide whether to add to your site. 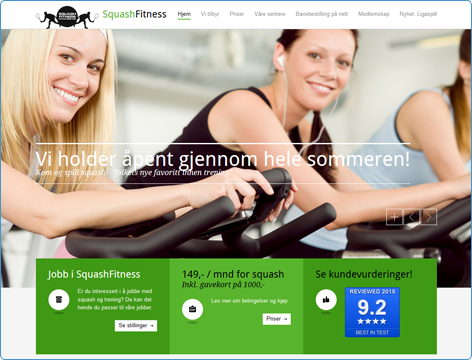 We will provide you with two widgets (a sidebar and a full-page width) that can easily be integrated into any website and will display a maximum of 10 testimonials. Whether your customers are raving about what your product has done for them or about the great service you gave, they're telling your visitors first and foremost that they had a positive experience with your products and company. Because testimonials aren't written in your own "voice", they stand out in your copy as candid and unbiased accounts of how well your product works. A good testimonial has the power to convince even your "tough sell" visitors that your product or service really made a difference in your customer's life and can help them, too. If you're not using testimonials on your website, you're missing out on one of the most powerful, easy-to-use and cheap marketing tools available to you. Most of us would rather act on a referral from a friend than make a purchase based on a sales pitch alone. We want to know that the product actually works before we take the leap to buy, and we're bound to put more trust in someone who has already used the product successfully than the person trying to convince us to buy it. Using glowing, fact-filled testimonials on your website will let your visitors know that you're worthy of their trust. 3. 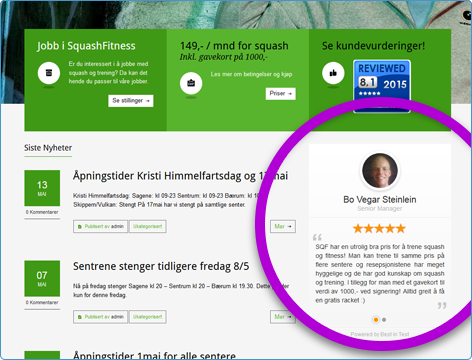 Copy and paste the automatically generated code on your website and your testimonials will appear there! 4. 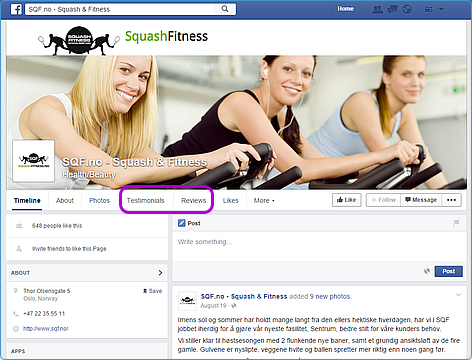 Add the Best in Test Facebook app to your business page and show your testimonials on your Facebook page as well. 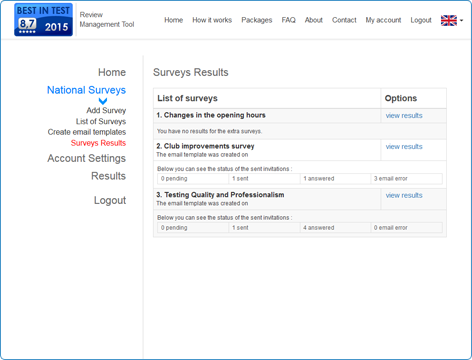 Whether you have to make important decisions, want to launch a new service/product or would like to know how and where to improve, a survey is a great tool. 1. 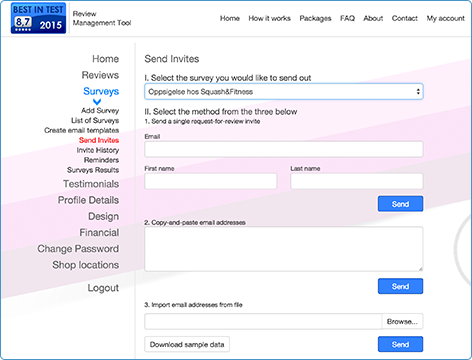 The software is very intuitive and in no time you can create a stunning survey. 2. 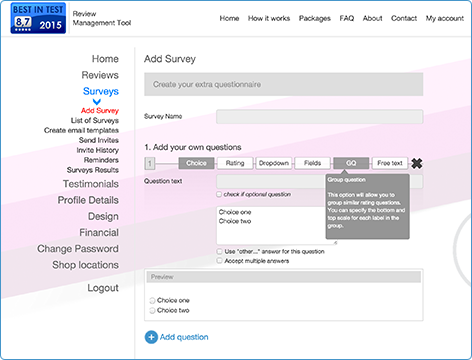 Have the survey completed face to face with our iOS or Android app or send it by email to your customers. 1. 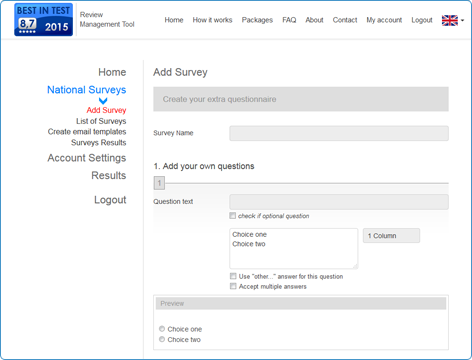 Set up a national survey. 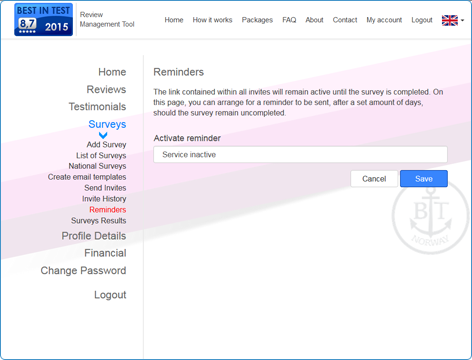 With one click, the survey will be sent to all your members’ accounts. 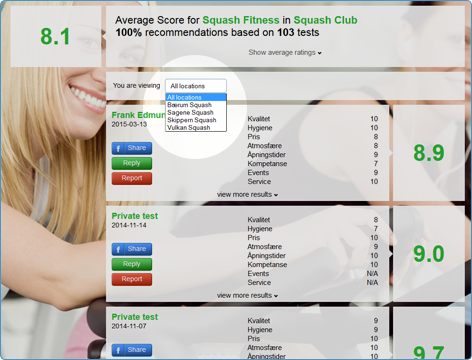 You can easily see how active your members are, analyse results and benchmark each location. 3. 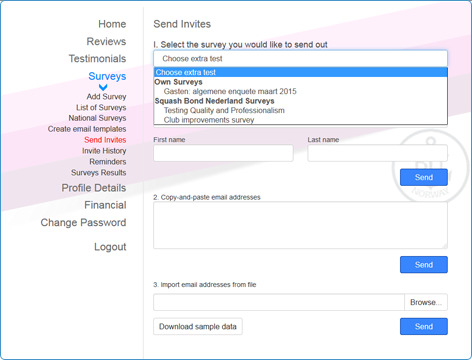 For each national survey, view summary statistics of the number of invites sent and the number that were returned. 4. 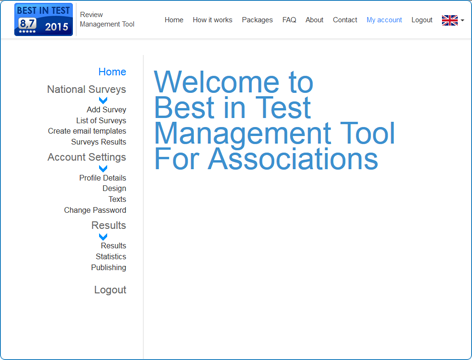 View all received results for the entire organisation or for specific members to benchmark results. 5. 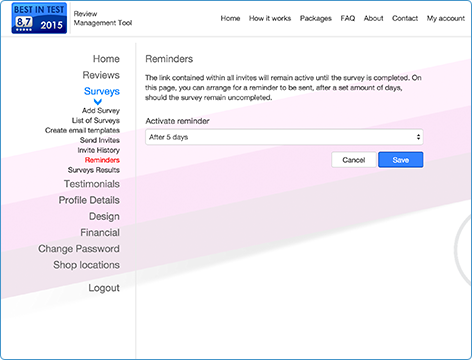 Automatic reminders are sent to those who have not yet completed the national survey, based on each member’s reminder settings. 6. 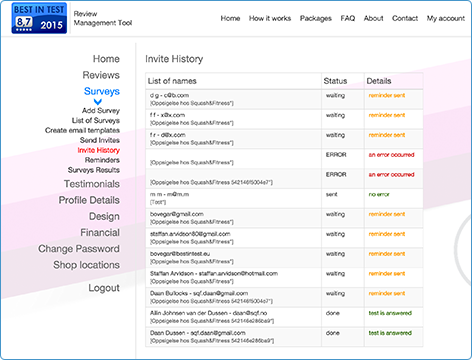 In the invites history, each member can see the status of invites sent (whether they were answered and if a reminder has been sent). This way, the members gather responses from customers and the head office only analyses the final results.